Wouldn’t it be good if we can type on our mobile phones with the familiarity of a standard desktop QWERTY keyboard? It is now possible with the new TREWGrip keyboard. With this new technology, you now can type with the comfort of a normal keyboard without worrying about having a case of finger cramps. TREWGrip is a keyboard that simplifies the way we type on mobile phones everyday. This is different from a traditional QWERTY keyboard as the keys are facing away from the user. Although the keys are on the rear of the device, one cool feature is that when a key is pressed, the corresponding key will light up on-screen to ensure that the correct button is pressed. This keyboard is more ergonomically correct than the standard mobile QWERTY keyboard because it is curved so the inner keys can be reached with minimum effort and maximum comfort. 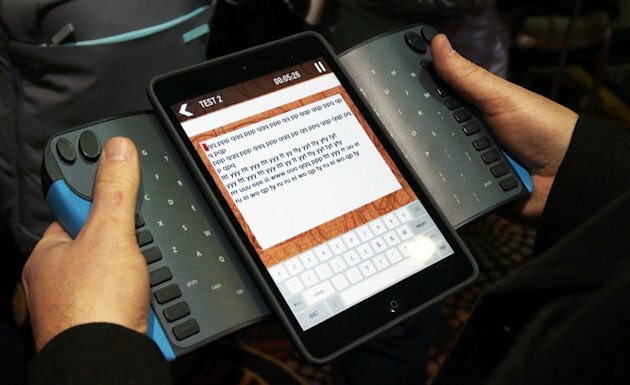 The TREWGrip is a universal mobile keyboard that is compatible with all phones, as it uses a Bluetooth connection. This device also has a micro suction mount to hold on to phones up to 5.3” wide when on the go. The TREWGrip mobile QWERTY is available for customization with a variety of colours and the size of their handgrips, varying from black, blue, red, or TREWGrip green for colour, and small, medium or large for size. The TREWGrip will be released at the CES 2014 at a price around $250. More information can be found at the official TREWGrip site.